Blog | Easy Inspiration Project | Berlin City Auto Group | A love of photography and cars. I took the Honda HR-V on a 2 week road trip to Nova Scotia and Newfoundland and had an absolute blast. I spent most nights camping in the back of the car with my friend and had plenty of room to sleep with all our gear. The HR-V was great on gas and the AWD system performed well on dirt roads and the red sand beaches of Prince Edwards Island. We took the car on a 7 hour ferry ride to Newfoundland where we explored the massive cliffs of the south eastern shore during the rain. My favorite parts of the trip were sleeping on different beaches with the trunk open and the warm ocean air blowing over us. 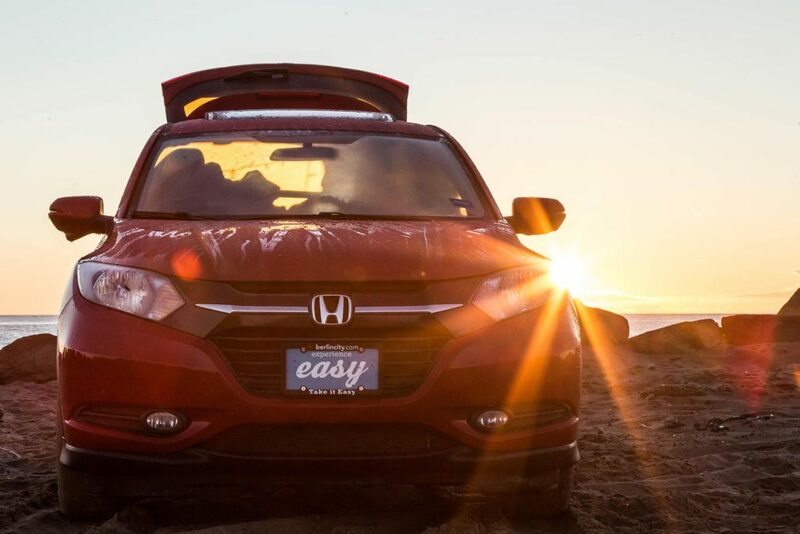 The whole experience was full of freedom and fun and the HR-V was our little home on wheels. I’m so grateful to Berlin City for helping make this experience forever memorable. I had a great time shooting the Ridgeline as it was one of the best trucks I’ve ever been in. Being all black, it looked incredibly sleek and clean. The interior was extremely comfortable with some of the most advanced technology I’ve ever seen in the car. 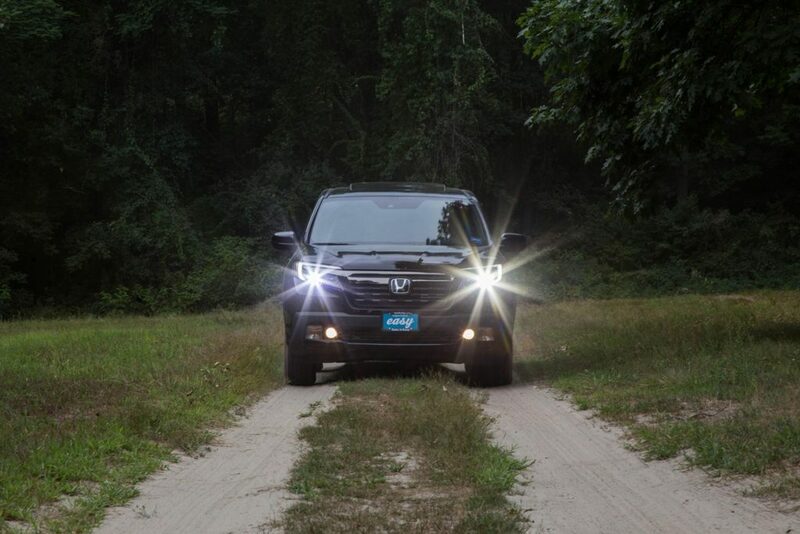 The utilitarian aspect of the Ridgeline was incomparable to most other trucks. From the giant compartment in the truck bed to the dual action bed opening, this was one useful vehicle. My overall experience was fun and exciting. 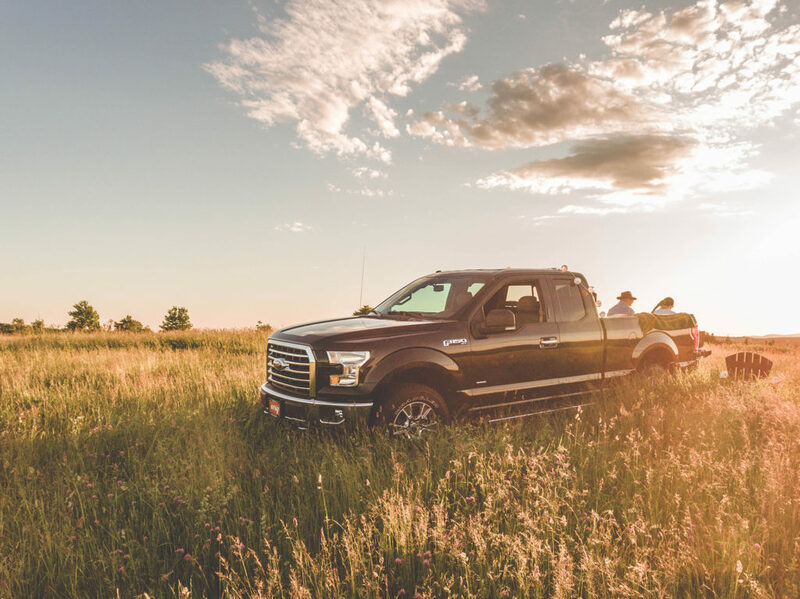 I took the truck down some dirt roads and in fields and the ride was perfectly smooth and controlled throughout. If I were to buy a truck, I would definitely get a black editing Ridgeline from Berlin City. My experience with Berlin City and the new Ford F-150 was great. The initial pick up and drop off went very smooth and the dealership was very easy to work with. I really wanted to step outside of the box for this project and had a lot of fun shooting the Ford. I tried a few new things and created lifestyle shots that were all scenarios I would use the truck for in real life; camping, gathering wood, enjoying a sunset, and adventuring around backroads. I can still hear the sound of the twin turbos spooling in that beautiful machine. The Easy Inspiration Project was a blast! 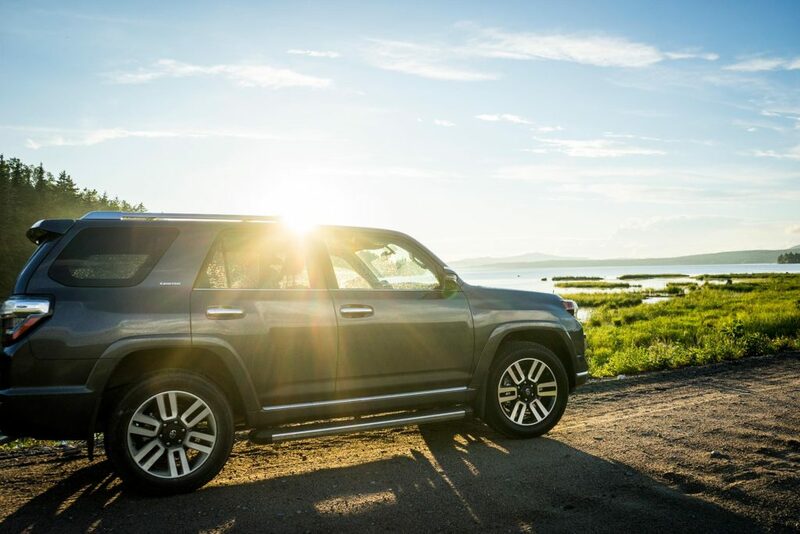 Ashley reached out to me back in June and made arrangements for me to pick up a Toyota 4Runner to drive around Maine for a couple weeks. The timing worked perfectly as we had plans for a family trip to Rangely and another trip to Mount Desert Island to meet some friends. 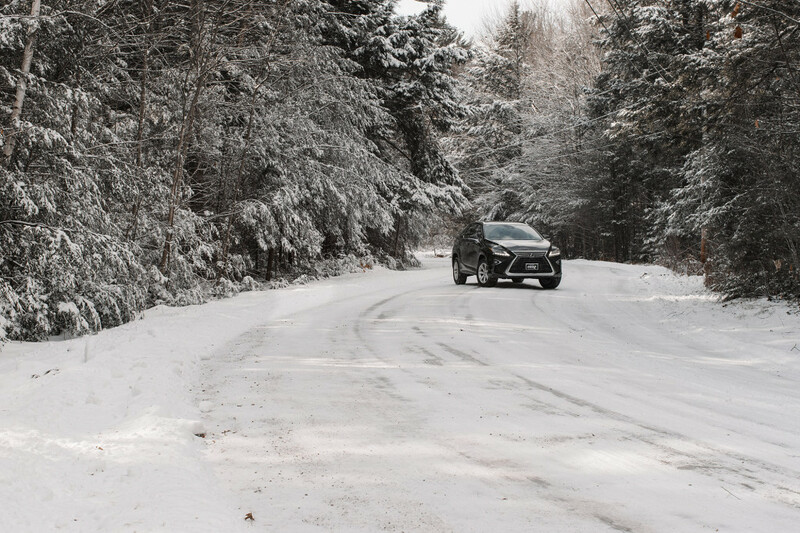 After loading up the 4Runner, with it’s huge and spacious interior, we hit the road and stopped along the way to make some images highlighting the beauty of Maine and the vehicle! A few sunset shoots later and a wonderful time exploring MDI, it was time to return the 4Runner back to its rightful owner. In the end, I would happily repeat the experience in a heartbeat. Thanks Ashley and Yegor for such a wonderful opportunity to collaborate on this awesome project! 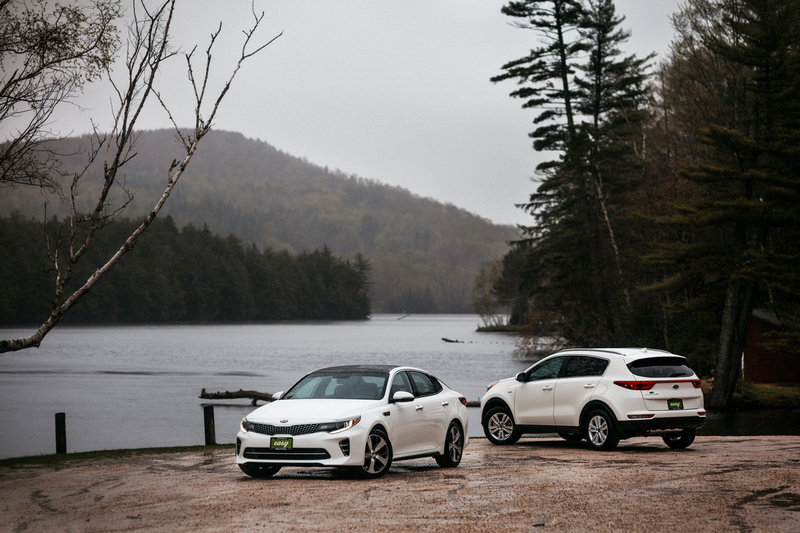 We had a great experience working with the Easy Inspiration team & shooting these Kia’s for the weekend. We end up in northern Vermont fairly often, both for work & pleasure, so we had a good idea of some locations to start off with. After exhausting those, we got lost on purpose & ended up stumbling upon some of our favorite locations that way. With a relatively tight 2 day shooting schedule & rain in the forecast for our second day with the cars, we thought day 2 would end up being mostly lost to the weather. Day 1 yielded some nice driving roads & familiar scenery, stopping at the increasingly well-known Prohibition Pig for lunch & stocking up on camping beers for the night. By the time we stopped seemingly every 5 minutes for photos of the cars, we got to our chosen location to camp in the Green Mountain National Forest. There was just enough time to get a fire started before it started pouring rain for the duration of the night. As it began to rain, the fire stayed lit, allowing us to grab some images of both cars around the fire. The morning of day 2 we woke to continued rain for a few hours, which again made for great photos, so no complaints. As the day went on & we drove further south, the weather cleared & all was well. As for the cars, we’re both avid car enthusiasts. Honestly, when we heard the cars we were going to be shooting were Kia’s, we weren’t exactly super excited on it. That being said, we were both pleasantly surprised with these cars, especially the Optima SX Turbo. The interior was a nice place to be, solid build quality, the flat bottom steering wheel looked great, & the black/red interior looks fantastic in person. So no complaints about Kia from now on. It was a great weekend & we appreciate the opportunity to be a part of this project! Having grown up in a rural area of central Maine, I have always been a fan of trucks. In fact, my first car was a 2008 Dodge Ram with a 3” lift. There is something about this workhorse of a vehicle that is embedded deep in rural areas of the country and, I suppose, in me. When I found out that I would have a chance to photograph the 2016 Titan Pro 4X, I knew immediately that I would have to get out of the city and back to my rural roots. That being said, I’m not sure the lovely folks at Berlin City expected just how far out of the city I planned on going. Where do you take a 3 ton pickup with an off road package and a Cummins turbo diesel under the hood? In Maine, the answer is simple, the county! For those of you who may not know, ‘the county’ refers to Aroostook County. Aroostook is Maine’s largest and most northern county. Here the terrain shifts dramatically from deep woods to vast agricultural fields. In short, it’s truck country! 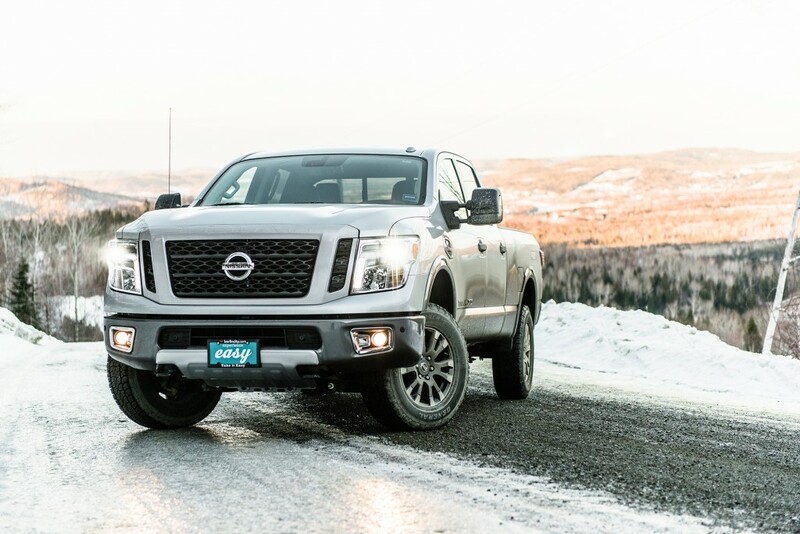 During our week with ‘the beast’ as our Titan was quickly named, we traveled over 1,000 miles and hit every possible driving condition you can think of. The goal was to photograph this truck in it’s natural habitat, off road and dirty. As you can see from the images, we accomplished our goal. The truck performed incredibly well. The mixture of rock solid off road performance on the outside and over the top luxury on the inside was incredible. The lifted and reinforced suspension matched with 8 ply off road tires and Nissan’s 4×4 system meant we were never afraid to turn down a muddy or unplowed road. On the inside, we were pampered with heated seats, a heated steering wheel, a Rockford Fosgate sound system and way more leg room than would ever be necessary. Combine these with killer features like a lift assist tailgate and super bright LED bed lights and you have one hell of a truck! We certainly didn’t take it easy on the poor girl. For a last hoorah, I decided on a whim to take the Titan down my favorite road in all of Maine, the fabled Golden Road. Running over 100 miles from Millinocket to Quebec. The majority of the road is dirt, though from time to time the dust settles enough for you to notice broken patches of what appear to be pavement. Needless to say, this is not the road to test your daily driver on. This road is for trucks. The Titan turned heads on the Golden Road. It quickly became obvious, that this is a truck for people who’s other truck is a Freightliner. During our adventure down the Golden Road, the truck’s tire pressure monitoring system sounded an alarm. Within 20 feet our rear driver side tire pressure had dropped from the normal 75 PSI to 40 PSI. It was obvious that we had a flat. Thankfully, the Titan’s warning system kept us informed and we were able to get out of the way and to a safe spot to change the tire. Miles away from decent cell reception, we hopped out of the truck, broke out the jack, and dropped down the full size spare. Within minutes we had changed the tire, a 7” chainsaw file was the culprit by the way, and were on our way again. I can’t say enough about this truck. I suppose the best way to wrap this up is to let you know that within 3 days of dropping off the Titan, I was visiting Berlin City again to test drive some mid-size trucks. I suppose you can take the boy out of truck country but you can’t take truck country out of the boy! The entire experience of the Easy Inspiration Project was flawless. From the moment the car was dropped off to when it was picked up, everything went very smoothly. Ashley and the team at Berlin City were so kind, accommodating and fun to work with. The car itself was great. 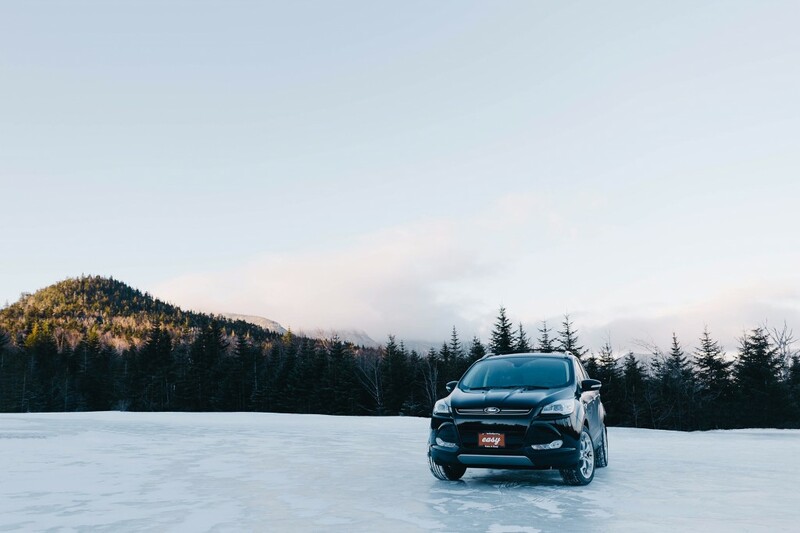 I was given a 2016 Ford Escape to shoot for a week, where I headed up to the northern parts of New Hampshire with a few friends to explore Franconia Notch, the Kancamagus and more. I didn’t face any challenges whatsoever — the only part that was even near challenging was deciding where to take it! The Easy Inspiration Project was an outlet for me to discover the hidden beauty of New Hampshire that I, and many others, overlook. A big thank you to everyone at Berlin City Auto Group for allowing me to be a part of this wonderful project. I really enjoyed participating in the Easy Inspiration Project! I had a lot of fun getting the chance to drive a brand new car around Southern Maine shooting in different areas. I thought it would be challenging as I don’t have much experience photographing cars but I approached it as I would portraits and I am happy with my images. 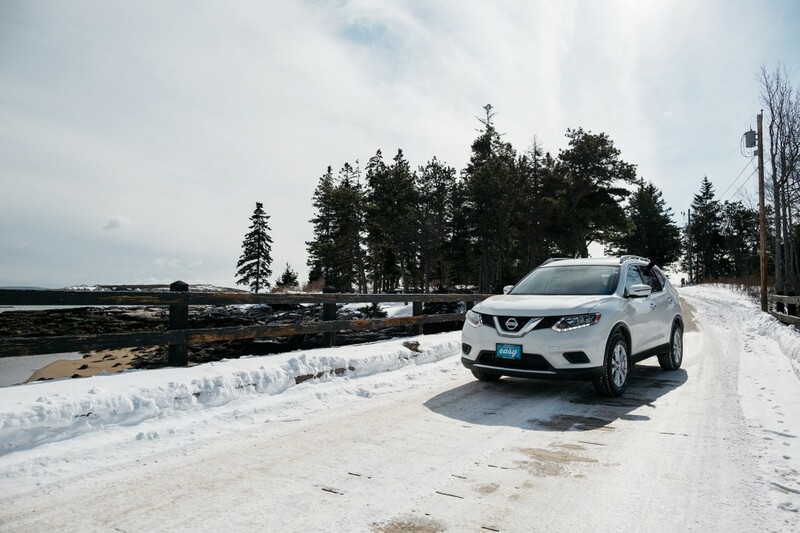 I happened to have the 2016 Nissan Rogue over one of the coldest weekends so far this winter in Maine, so I was really happy that it had heated seats and warmed up quickly. Having the Lexus was awesome. Abby and I spent the days we had it exploring some of our favorite spots and new areas we had yet to photograph. The car was amazing, it drove perfectly and was super photogenic. One of the difficulties I faced was keeping the car completely clean during shoots. I photographed the car mostly in the snow, so as soon as we were on the road it got covered in salt. We ended up working around it by using the snowfall to our advantage. The Easy Inspiration Project really made things… easy for me by giving me such an awesome looking subject, a sunburst-orange Toyota Tacoma. This thing turned heads. To this day, people around the island stop me and ask, “weren’t you the guy taking pictures of that truck?” Despite having such a stunning subject I did run into some problems. Typically, when I’m out with my camera, I am working hard to avoid pavement, cars, trucks, and most anything manmade. For this reason, shooting for the Easy Inspiration Project challenged me. 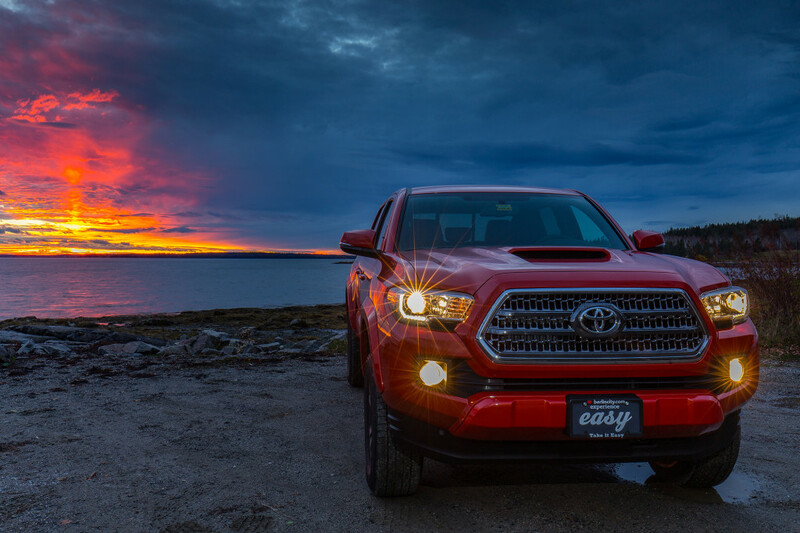 I had to completely reverse my thinking and figure out how to create compelling landscape photographs that included a Toyota Tacoma as the subject! Since moving to Mount Desert Island I have spent day after day hiking the trails of Acadia National Park and the surrounding area in search of what have become my favorite locations to shoot, but with a truck as my subject I had to start pretty much from scratch and begin location scouting all over again. Once I started finding locations everything fell into sync. I was able to use my usual techniques when photographing landscapes. Out came my graduated ND filters, my polarizing filter, my strobes. It quickly became just another day at the office for me… in the best of ways. I prefer to capture a scene with one single frame. Rather than combining images to create properly exposed photos I use filters in front my lens to control the exposure. From there everything goes into Adobe Lightroom for basic editing. I love teaching this technique. I want to show other photographers who are just starting out that it is possible to create stunning, well balanced images without relying heavily on photo editing software.